Aside from being one of my favorite 90s country bands (“Amy’s Back in Austin”? “My Love”? Anyone? No? Just me? ), Little Texas also can refer to my new piece on our office gallery wall. This little gallery wall has plenty of room to add to it and I’ve been anxious to start filling it in since we put the first few pieces up. 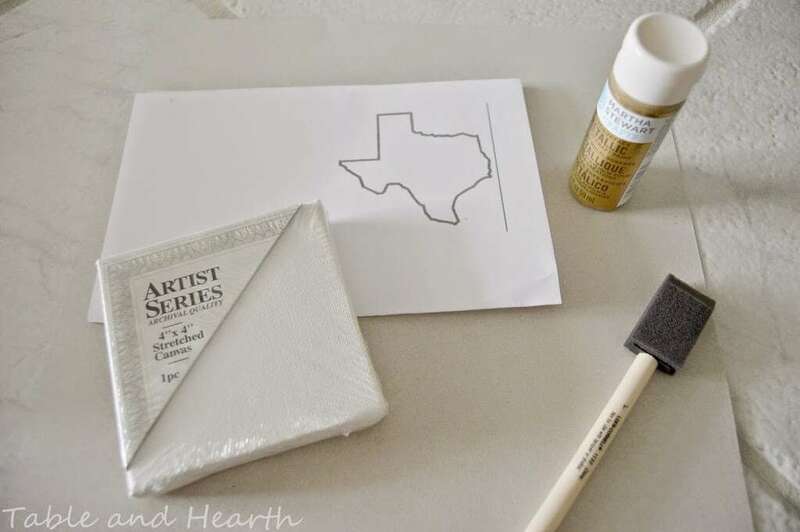 I knew I wanted to DIY some of it so when I saw my friend Erica’s state canvas over at Dwell Beautiful, I just had to do one for Texas. I mean, we already have my state bird art from Wooden Pencil Co. up there so why not go with more state stuff? 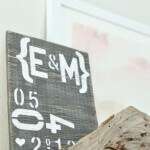 I headed over to JoAnn’s after work this week to pick up the supplies for this and a few other projects and found everything I needed except for the stencil. I did like four laps around that store (and we have a big JoAnn’s) and couldn’t find them anywhere. I finally asked an employee who told me they don’t carry stencils. Um, ex-squeeze me?!? JoAnn’s doesn’t carry stencils??? What kind of crafts store doesn’t have stencils??? I was floored. And I refused to drive to Hobby Lobby (bleh) or Michael’s (in a horrible location) just for a stencil so I changed my design. 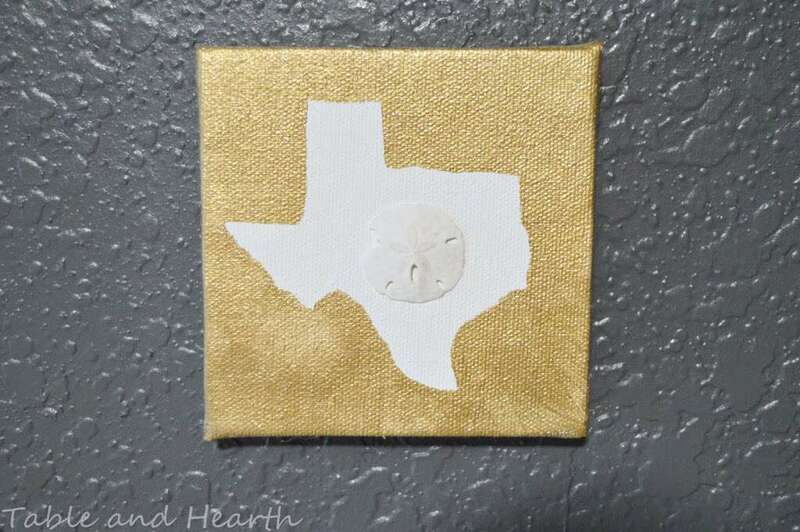 I got a small (4″x4″) canvas to even out the sizes in the gallery wall, and to leave me more room for future art :) I grabbed gold paint cause I love the way it looks against dark blues like our wall is and found an outline of Texas online then played with the scale to get it down to the right size. 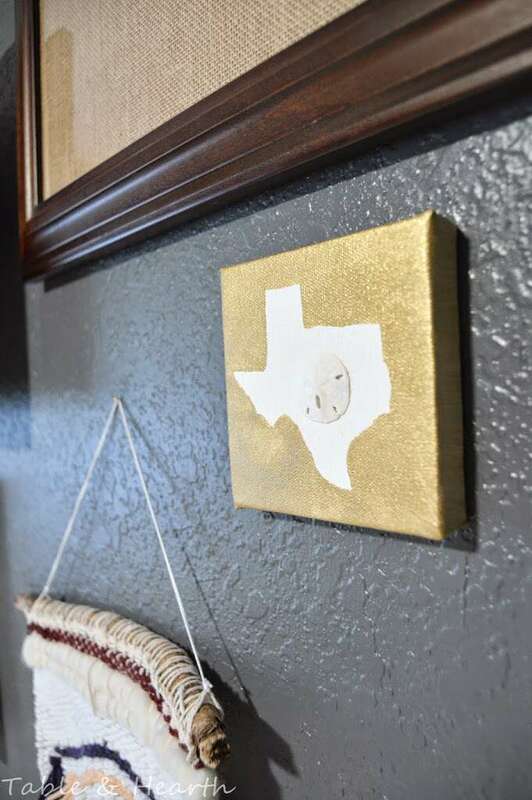 I traced my Texas onto a piece of paperboard so it would have more rigidity, cut it out, then taped it onto the canvas. And just painted around it (radiating outwards) and on the sides. I’m no craft paint connoisseur by any means but this gold Martha craft paint may be my new most favorite thing ever, I want to paint everything with it. Ev.er.rah.thang. How cute! I keep seeing those adorable little canvases at craft store but I can never think of what to do with one, but this is just perfect! So cute! I might have to do this when I do my office. We are displaced Texans, but will always have love for our home state! Just how cute is that? I love it! I really like the bird print too! I love having State themed walls! This is such a great idea! 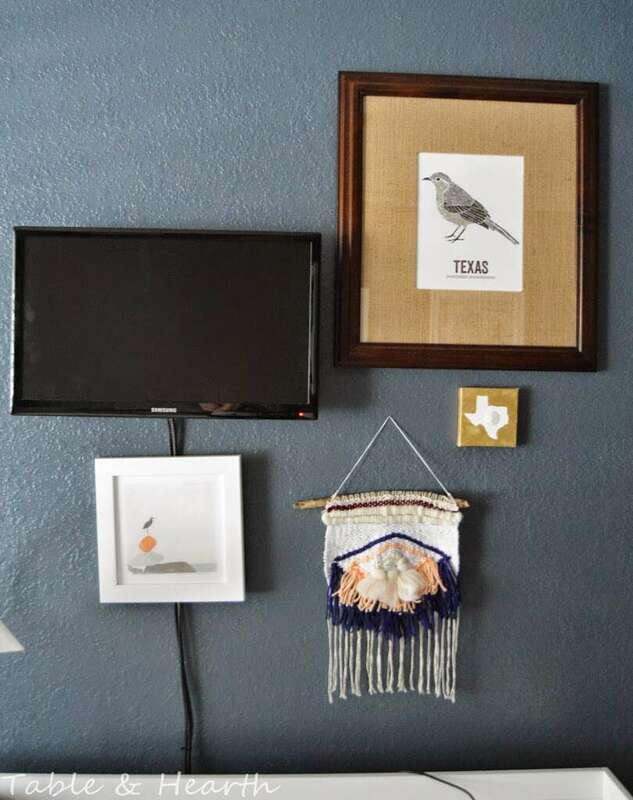 and I just love that Texas bird print!!! Wooden Pencil CO is one of my favorites! It looks great! I’m not crafty, so I sure appreciate those who are. 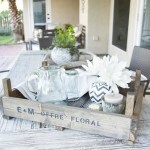 As a coastal Texas blogger, I love this so much :) Pinned! 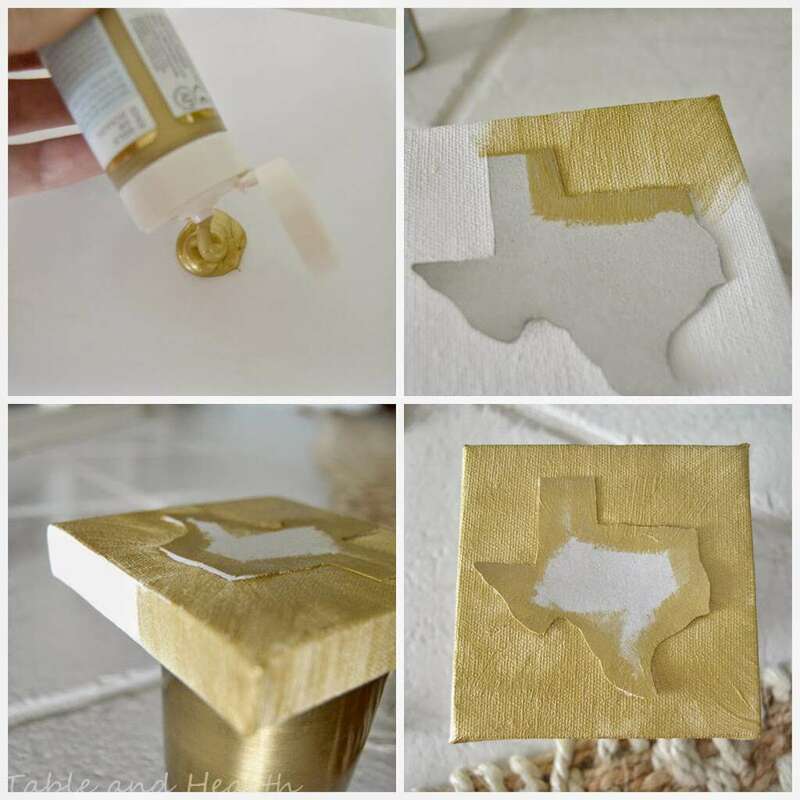 I want to make one of these of Texas (for my husband, who loves where he’s from) and one of AZ for me (where I’m from.) And we don’t live in either of those states, so this would be great for us. Thanks for the tutorial. Pinning. Two would be so cute together, what a great idea Julie!! Hey it turned out great. And it’s something that pretty much anyone can do. Hope you have a great day! Very cute! 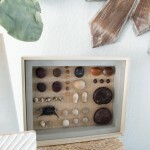 I have a good friend who just moved from MA back to Austin, this would be the perfect house warming gift! Aw, it would!! Congrats to your friend, I would LOVE to move to Austin! That will be super cool Keitha!! Stunning! Everything looks amazing! Thanks for linking up to Pin Worthy Wednesday! Thank you Tara! And thanks for hosting!